The Sun & planets to scale. Surface of Mercury with false colours showing elevation. MERCURY makes its best morning appearance of 2019 in April. It reaches greatest elongation on the 12th when it will be 28o west of the Sun. At this time its magnitude will be +0.2 and, in a telescope, it will look like a tiny last quarter moon (Phase 50%), 7.6” in diameter. On April 3rd at 8am Mercury will be 0.4o north of Neptune (magnitude +7.9). VENUS is the brilliant morning star (magnitude -3.9) rising at 4am at the beginning of the month. In a telescope it will show a gibbous phase of 85%, 12.3” in diameter. On April 10th Venus will pass 0.3o south of Neptune (magnitude +7.9). MARS is a bright reddish evening star in Taurus and sets at about 10pm. Its magnitude is +1.3 and, in a telescope, it will show a slightly gibbous phase (95%), 4.4” in diameter. Bright patches in the Occator crater on Ceres. NASA. CERES is an evening star in the constellation of Ophiuchus. At our observing evening on April 6th its magnitude will be +8.1 and its co-ordinates 16h 53m 24s, -16o 38’ 32”. Ceres will be stationary on April 9th. Jupiter and its moon Io. JUPITER is a brilliant star in Ophiuchus rising in the south-east about 11pm at the beginning of the month. At our observing evening on April 6th Jupiter will have a magnitude of -2.3 and a telescopic diameter of 41”. At this time the configuration of Jupiter and its satellites will be, from west to east, Europa-Io-Jupiter-Callisto-Ganymede. Jupiter will be stationary on April 11th. SATURN is a bright star in Sagittarius and rises in the south-east about midnight at the beginning of the month. Its magnitude is +0.5 and its telescopic diameter 16.5”. Saturn will be stationary on April 30th. 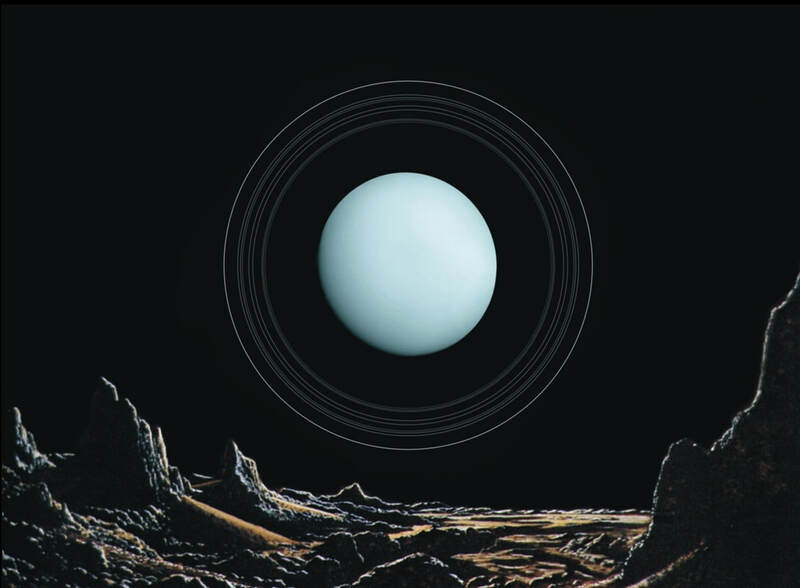 The rings of Uranus seen from its moon Ariel. URANUS is in Aries and is too close to the Sun for observation. The planet reaches conjunction, the far side of the Sun, on April 23rd. NEPTUNE is a morning star in Aquarius and on April 10th it will be 0.3o north of Venus. Neptune has a magnitude of +7.9 and a telescopic diameter of 2.2”. PLUTO is in Sagittarius and rises about midnight at the beginning of April. At magnitude +14.7 it is visible only in large telescopes. Pluto is stationary on April 25th. ERIS is a morning star in Cetus. Its magnitude is +18.8.